This page was set up by Robert Sewell in June 2006 to show the Puleston Family of Emral Hall, Flintshire since the earliest known times. Robert Sewell graduated from McMaster University (Hamilton, Ontario, Canada) in 1967 with a B.Sc. degree in chemistry. After a year of studies at the University of Toronto's College of Education, he taught high school science in Collingwood, Ontario for a year and then taught chemistry, physics and general science in Hamilton, Ontario for twenty-nine years. Robert Sewell retired from teaching in June 1998. Please visit the Sewell Genealogy Site Map for other pages in this series. This page is under construction and will be modified as material is verified. The Puleston family of Emral Hall, Flintshire, Wales appears to be fairly well documented; but there are many conflicts and inconsistencies to be researched. 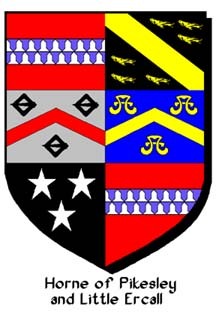 There is a definite connection between the Pulestons of Emral Hall in Flintshire and the Hornes of Pickesley in Shropshire because the ancient Arms of Puleston (Sable, three mullets argent) are included in the Quartered Arms of Horne listed in the Shropshire Visitation of 1623. Mr. Ian Sinclair for information on the Puleston Family. inherited from his father's cousin, the late Mr. Arthur Puleston. collected by Mr. Perkins, Mr. Puleston and Mrs. Harrison. Mr. Geoffrey R. Horne for sharing his information on the Horne Family. Mr. Sewell V. Sample for the photocopy from The Visitation of Shropshire, 1623. Burke’s Peerage, 1898, Page 1145. For details, click on Puleston Lineage. Pages shared by Mrs. Margaret Littlejohn that originated with Puleston researcher Mrs. Sunter Harrison. For details, click on Pulestons of Shropshire and North Wales. These volumes are listed at National Library of Wales but I have been unable to find them elsewhere. Pages shared by Mrs. Margaret Littlejohn. Information shared by Mr. Ian Sinclair from Mrs. Sunter Harrison: The Early Pulestons Wrexham, 1975. The surname of the Puleston Family was originally written De Pyvelesdon, and its settlement in England may be referred to the period of the Norman Conquest. For details, see Burke’s Peerage, 1898, page 1145. Sir Richard Pyvelesdon, of co. Salop, Knight. Note that Salop is the same as Shropshire which comes from the Old English Scrobbesbyrigscir, the shire with Shrewsbury at its head. The Normans found the Old English for both Shrewsbury and Shropshire; Scrobbesbyrig and Scrobbesbyrigscir difficult to pronounce; so they softened them to Salopsberia and Salopescira. Salop became the shortened form of both. The above is from a message (now deleted) at Virtual Shropshire. Roger Pyvelesdon was appointed Sheriff of Shropshire in 1241. He was responsible for the vivary (fish farm) at Aqualate, Newport. 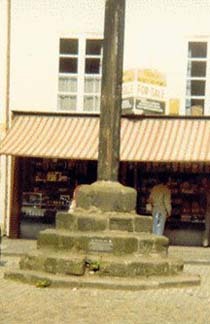 He died in 1272, and a cross in his memory was erected on High Street, Newport in 1289. Thomas de Pyvelison, who married Helen, a niece of Michael Tovey who was Mayor of London in 1244 and 1248. Thomas fought on the side of Simon de Montfort who led a revolt against King Henry III. Simon de Montfort ruled England as a military dictator; and was deposed and beheaded in August 1265. As a supporter of Simon de Montfort, Thomas de Pyvelisdon was arrested and imprisoned in Dover Castle. He was released in 1276 and died in 1277. Sir Roger De Pyvelisdon of Emral Hall, Flintshire, Wales. Died circa 1280 - 1304. Roger De Pyvelisdon was lynched by the Welsh while attempting to collect taxes for King Edward I. Some sources claim this lynching occurred as early as 1280, most give 1294; and Burke’s Peerage, 1898 (page 1147) states he was "sheriff of Anglesey, 33 Edward I., 1304, and keeper of that county; but the Welsh, averse to foreign rule and taxation, seized upon Sir Roger, and caused him to be hung." Roger Puleston, died after 1295. Alice De Pyvelisdon who married Robert de Harley. Sir Richard De Pyvelisdon, Knight of Emral, Sheriff of Caernarovonshire, and representative in parliament for the borough of Caernarvon. Born circa 1260 in Ywern, Flintshire, Wales. Mentioned in various documents from 1278 to 1314. Richard married Angharad (or Agnes) Warren who was born circa 1264 in Warren Hall, Salop. Angharad is said to have been "a daughter of Sir William Warren, Knight". Burke’s says her father may have been Sir Griffith Warren. Some perhaps overly enthusiastic online genealogies claim that Angharad Warren was a daughter of William de Warenne, 7th Earl of Surrey and Joan de Vere. This implies a descent from a number of persons connected with the Magna Charta. However, William de Warenne was born circa 1256 and was killed in a tournament at Croydon on December 15, 1286. It is uncertain when Joan de Vere was born, but her father, Robert de Vere, 5th Earl of Oxford, was born in 1240. William de Warenne and Joan de Vere could not possibly have had a child circa 1264. More research must be done on the descent of Angharad (or Agnes) Warren. and Magna Charta Sureties, 5th Edition, Lines 121 and 151. Sir William Pyvelisdon, Knight of Emral, living June, 15 Edward II (circa 1322); died after 1323. Elizabeth (may be the same as Isabella below) who married Philip Chetwynd of Ingestre. Alexander Puleston who married Agnes. John Puleston, died after 1364. Although he was apparently the eldest son, it is unclear why he didn't succeed his father. John is mentioned in documents in 1362 - 1364 with regard to being in Ireland on the King's service. Roger Puleston, Esq. of Emral, living temp. Henry VI., and Edward IV., who was deputy in 1460, of Jasper Tudor, Earl of Pembroke, Captain of Denbigh Castle; and who m. Janet, dau. of Thomas Bulkeley, Esq. of Eaton, co. Chester, son and heir of Sir William Bulkeley, Knt., by Margaret, his wife, dau. of Sir Richard Molyneux. For the continuation of this line, please click on Puleston Lineage which is copied from Burke’s Peerage, 1898, Page 1145. 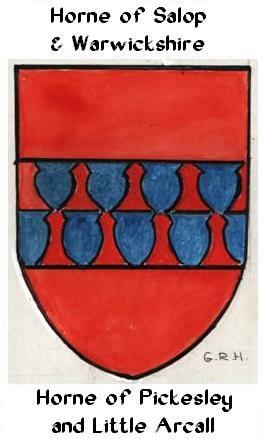 Madoc Puleston (died after 1426) who married Anghared, a daughter of David Ap Gronwy of Burton. Katherine Puleston who married David Ap Howel of Deirnion. Anne Puleston who married Llelyn Ap Ednyvedgam. At this point, there is a gap in our Puleston lineage leading to Jordan Puleston who is named in the Shropshire Visitation of 1623. Some online genealogies (eg. www.ancestry.com) attempt to fill this gap as follows without naming their sources. It may well be that the persons named in the following generations are part of a direct line linking the Pyvelesdons, Pyvelisdons and Pulestons of Emral Hall in Flintshire above with Jordan Puleston (Shropshire Visitation of 1623); but sufficient evidence of this appears to be lacking. Jordan or John Puleston, said to be named in The Visitation of Shropshire, 1623 as shown immediately below. Richard Puleston, said by some to be the same as Richard de Pyvelisdon of Emral who married Lucy or Lleuki, a daughter of Madoc Voel of Eglwysegle as shown above in Generation Five. Sewell V. Sample who kindly sent me a photocopy of The Visitation of Shropshire, 1623. 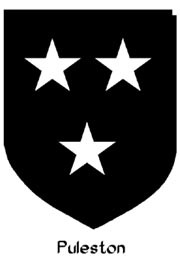 Jordan Puleston who must have been a descendant of the Pulestons of Emral shown above because the Puleston Arms (Sable, three mullets argent) were allowed for quartering in the Shropshire Visitation of 1623. Born circa 1440 in Moreton,Staffordshire. Thomas Morton married Julian le Boteler or Julianna Butler who was born circa 1440 in Shropshire, and whose uncle was Lord Butler of Norbery. Born circa 1464 in Willbrighton,Gnosall,Staffordshire. Margery Morton married John Horne who was born circa 1464 in Pikesby, Child’s Ercall, Shropshire. Born circa 1490 in Pikesby,Shropshire. the Arms of Horne pictured to the right. Reginald Horne who married Anna Pachet, a daughter of Thomas Pachet of Barwell. Reginald is mentioned in the will of Henry Sewall as a "kinsman." Click HERE for details. John Horne. John is mentioned in the will of Henry Sewall as a "cosen." Click HERE for details. 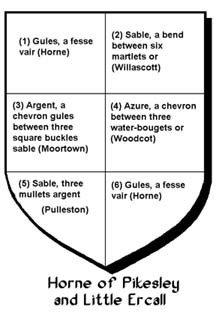 Quarterly of six: 1 and 6, Gules, a fesse vair — HORNE in Shrewsbury MS.; 2, Sable, a bend between six martlets or — WILLASCOTT in Shrewbury Ms.; 3, Argent, a chevron gules between three square buckles sable [MOORTOWN]; 4, Azure, a chevron between three water-bougets or — WOODCOT in Shrewsbury MS.; 5, Sable, three mullets argent — PULLESTON in Shrewbury MS. I have drawn these arms as shown next. Please send corrections to Robert Sewell. For the continuation of the this line, please see The Robert Sewell Page. Click to return to the top of this page. Please visit the Sewell Genealogy Site Map for other pages.